I have had and certainly heard a few variation of cMoy before, but this is the first cMoy I have heard with a bass boost switch. 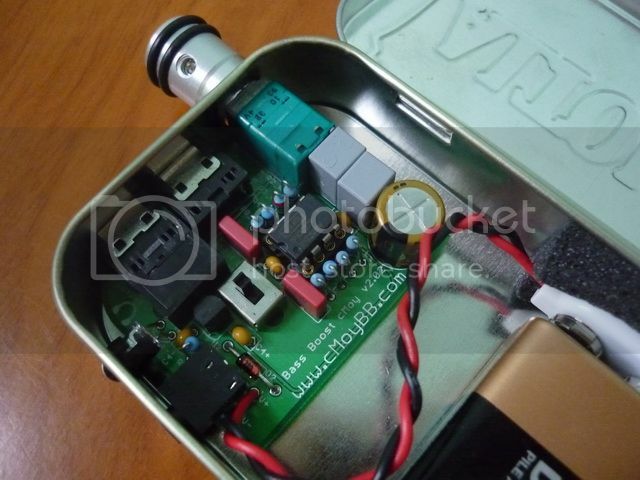 cMoy is itself an fairly old design, first made and schematic published by the well respected Chu Moy @ Headwize.com. 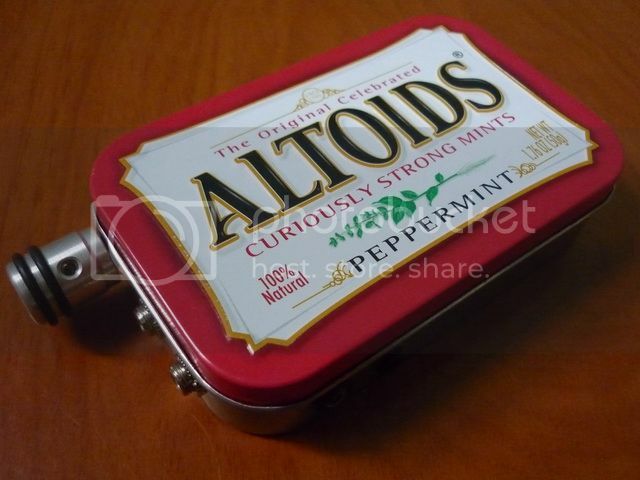 It is the portable headphone amp that invented the whole portable amp market, which is something we ought to thank Chu Moy for. 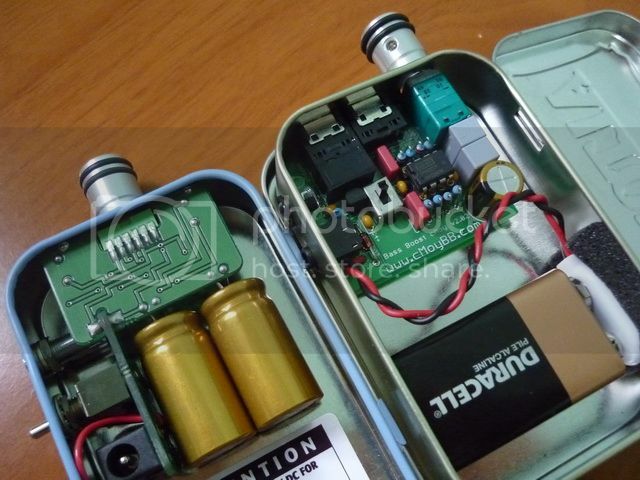 The cMoy with Bass Boost v2.02 by JDS Labs that currently under review is however said to be the more advanced version of the original design. The obvious question is of course, how good can a cMoy be? cMoyBB v2.02 comes in a mint tin, as most eBay's cMoys do. The bass boost switch is in the middle. Both volume pot and the headphone jack (left jack in picture) are acting as power switch. Build quality wise, this cMoy'BB' is pretty close to top notch for what essentially is a hand-soldered, DIY'ish product. The only other DIY product I have ever seen that has a better build quality are the PenguinAmp series, made by the same guy who are currently running Headphonia / HeadStage (maker of the Arrow 12HE amp). As you can see from the picture, the cMoyBB is built on a professional PCB (Printed Circuit Board) instead of a more rudimentary protoboard. If you are the type who likes to DIY, you can purchase the PCB from JDS Labs and make the cMoyBB yourself. The PCB is around $6. The whole amp, fully assembled and with battery, is about $70 + shipping (or $75 + shipping if you buy from eBay). As far as the sound quality goes, cMoyBB is indeed the best cMoy I have heard so far. I rolled the same opamp used on cMoyBB (OPA2227) into my other cMoy, the Jaben cMoy (which I soldered about 2 years ago and I always thought it to be pretty decent sounding), and compared it to the cMoyBB. There is almost no comparison - cMoyBB is simply a class above Jaben cMoy. But given I only paid around $20 in total for the simple Jaben cMoy kit and soldered it myself, I guess the result is to be expected. cMoyBB next to an old, first gen. Penguin amp. It is pretty obvious why it is called a Penguin amp. 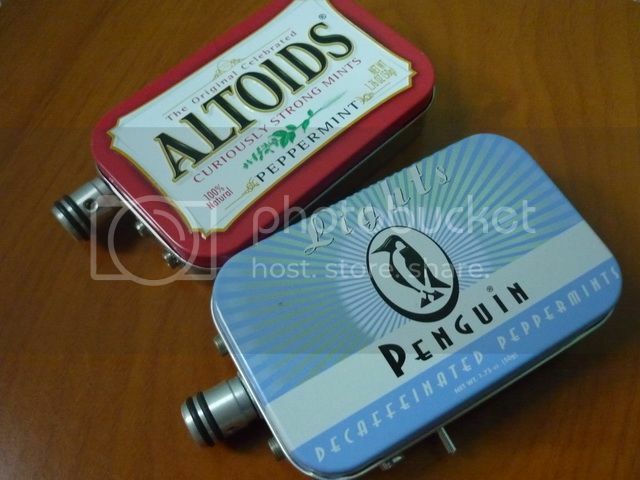 Left: Penguin amp; Right: cMoyBB v2.02. Penguim amp is a modified cMoy as well. So how good cMoyBB is when compared to a similarly priced amp, said FiiO E7, which is about $85 with free shipping? Fed by Sansa Fuze's line-out via my newly mod'ed FiiO L6 LOD and listened with HifiMan RE0 and Etymotic ER4S, cMoyBB sounds more spacious and airy, bass note is full of impact but doesn't quite have the texture to go alone (even with bass boost on). It has better detail, but also sounds just a little sibilant. E7 is warmer and smoother, vocal is sweeter and bass, though can't be boosted to the same level as cMoyBB, still has better texture. Overall the performances are comparable between the two, though it is worth to note that cMoyBB has higher gain than E7. For example, E7's volume 30/60 is roughly equal to 9 o'clock and a half on cMoyBB volume pot. Two things that I like about cMoyBB over the E7 are: 1st, cMoyBB bass boost is better than E7's in the sense that it not only give a big bass boost, but also adds warms to the sound and does not reduce the treble much. It works fantastically well with analytical sounding IEM such as HifiMan RE0 and Etymotic that I used for this review. 2nd, the opamp on cMoyBB is roll-able (exchangeable), which means it can be improved (or simply tuned differently) if you are willing to spend a bit more on new opamp. In fact, my cMoyBB is not on the default OPA2227 anymore. So in short, if you are only interested in amping and nothing else, cMoyBB is a probably a better choice. But if you ever need a DAC, then E7 is still the bigger bang for the bucks as a complete package. Now let's talk about opamp rolling on cMoyBB. The default OPA2227 is pretty good sounding and definitely better than the previously popular cMoy-opamp-of-choice, the OPA2134. However as mentioned before, the downsides of OPA2227 on cMoyBB are it sounds just a little sharp and doesn't quite have enough bass texture. I tried a few other opamp that I have in stock, mainly OPA2134, OP275, AD8066 and AD8620. Personally I find both AD8066 and AD8620 to work out really fine on cMoyBB. They have a more textured, better layered sound and can produce detail without being sibilant. The other main difference is the both AD has a warmer sound while the OPA2227 is colder in comparison. With the AD8620, I reckon cMoyBB is almost as good sounding as many $100+ portable amp. It certainly is better than my iBasso T4 and gives the T3D a run for its money. Still, as good as cMoyBB with AD8620 is, my cMoy2 remains the best DIY portable amp in my collection. 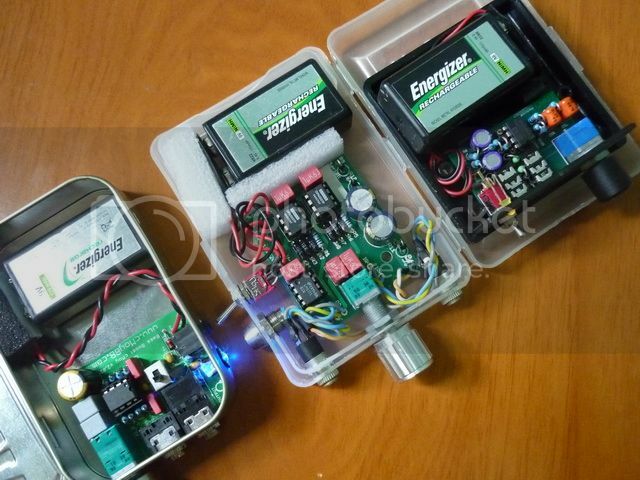 From left: cMoyBB v2.02, cMoy2, Jaben cMoy. Do note that AD8066 and AD8620 are SOIC8 package so they won't fit on cMoyBB's DIP8 socket without an adapter, such as those from BrownDog. Premounted (on adapter) AD8066 and AD8620 can be found online though, but they are not cheap - roughly $15 and $30 each. If you do get them, you will also need another DIP8 socket as well, to create enough clearance in space since there are 8 resistors mounted too closely to the original DIP8 socket. Without an extra DIP8 socket, the adapter might not get enough space to go in. Also, if you use a DC adapter to supply extra juice to the cMoyBB, you need to be sure that whatever opamp you are using can accept the DC voltage you supply to the amp. Overall, I am impressed and pretty happy with the JDS Labs' cMoyBB v2.02. Sure it is almost twice as expensive as most cMoy on eBay these days, but it does have the quality as well as the performance to justify the price tag, and maybe even the claim of best cMoy in the market.